Boxed set. Metal case. Gold-tone bangle features a jewelry clasp closure. Round face. Three-hand analog display with quartz movement. Black dial features gold-tone hour markers and hands and Anne Klein detailing. 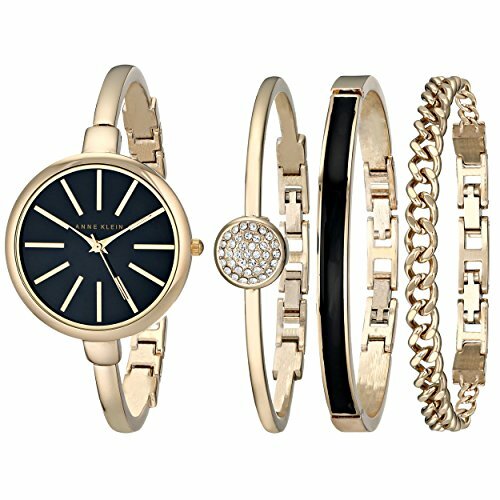 Comes with three additional bangle bracelets: one gold-tone bangle with black enamel filling, one gold-tone bangle with a clear Swarovski crystal accented center piece, and one gold-tone chain bracelet. All bracelets feature a jewelery clasp closure and an extender link. Splash resistant.